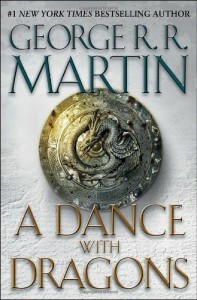 Six years after the release of “A Feast For Crows”, 2011 saw the long-awaited released of the fifth novel in the “A Song of Ice and Fire” series. It arrived on a wave of hype and expectation heightened by the hugely successful first season of the HBO’s TV adaptation of the series. I find this a slightly difficult book to really decide exactly how I feel about it. On the one hand, Martin's writing, characterisation and world-building is as good as ever and I enjoyed reading all 1000 pages of it. On the other hand, although quite a lot did happen in the book and the pacing didn't feel too slow the lack of any real conclusion to many of the plotlines is a bit disappointing - admittedly one of the plotlines does have what appears to be a conclusion, but based on past experience with Martin’s writing I'm not sure I believe that it is a really a conclusion. It's particularly frustrating because it did appear about three quarters of the way through the book that the Winterfell and Mereen plotlines were building to a climax but the book stops some way short of that. Of course, I don't expect book five out of (allegedly) seven in a series to work as a standalone novel, but the first three books in the series did have more of a climax than either A Feast For Crows or A Dance With Dragons did, and I think they were stronger novels because of that. I also suspect that if I drew up a list of the 10 best moments in the series they'd probably all be in the first three books, which is not to say that there aren't some great scenes in the book, there just aren’t as many as in the earlier novels. I think Jon's storyline at the Wall and the political manoeuvrings as different forces contend for control of the North (as shown in Reek’s chapters) were the best bits of the book and they are the two plotlines where I'm most keen to find out what happens next. Bran's plotline is also interesting although he arguably doesn't get enough chapters and barely appears in the second half of the book. During the writing of the book Martin made several comments about having difficulty making the Mereen plotline work, and I think it is still one of the weaker plotlines due to having a lot of sometimes repetitive build-up and only a partial conclusion, Dany also seems to get less character development than other characters with a lot of chapters like Jon and "Reek". Away from the East and the North there are a few token chapters for Jaime, Cersei and the Dornish but not much progress is made in those plotlines, and I suspect they may have been included largely as a reaction to the complaints about some characters being completely missed out of the previous book. Griff is one of the more interesting new characters and plays an important role in an intriguing new plotline, but perhaps a bit more time could have spent on that part of the story. Tyrion's plotline is a bit of a travelogue which sometimes feels a bit contrived and many of the incidents in it seem a bit irrelevant in the context of the story as a whole. I think the comments above may make it sound like my reaction to the book was more negative than it actually is. I did enjoy the book, and it was a good experience to be back in Westeros after such a long wait, and I suspect this will still rank as one of the best fantasy books of the year, but I think it still falls a bit short of the best books in the series, probably the fourth best out of the five, a little bit ahead of A Feast For Crows. I suspect any readers who may already have had mixed feelings about the series probably would not get much out of the book, fans of the series will probably still mostly enjoy it but may regard it as being a bit of a missed opportunity.